I know near enough nothing at all about this creature but, somehow, I just love this gloomy picture. 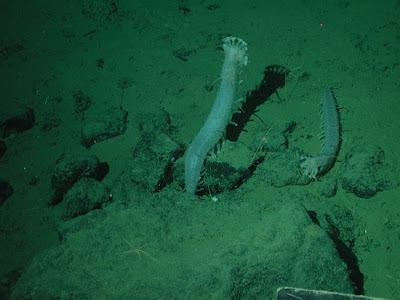 This is Laetmogone violacea, a Sea Cucumber from the deep. They have been found in many parts of the world and apparently live to a depth of at least 2,500 metres (8,000 ft). They exhibit bioluminescence when threatened, perhaps to scare off predators. Maybe it's more crafty than that. Perhaps the light can attract the predators of its own threatening predator. If you see what I mean. Anyway, in this picture we can see the heart-breaking muddy desolation of this Sea Cucumber's habitat. It is, of course, a gigantic platter of food for Laetmogone violacea. They will just walk around gobbling up the mud and digesting whatever edible detritus they happen to swallow. The rest is just passed out the other end. We can see the tentacles at the mouth end that are used to shove mud down its throat. There are also those weird leg things running down their bodies. These look to me like big tube feet, just like the tentacles. They might be used to stop them sinking into the mud. I'm sure it would be extremely embarrassing for a mud eating Sea Cucumber to sink into its own food and disappear forever!